I have an urgent deadline; can you meet it? Lead in times are usually 7-14 days (waiting time to commence field work) however we will accommodate urgent jobs wherever possible. Please call 01158 497 685 for an up to date timescale or submit a quote request which will provide all the information we need to provide an accurate lead in time and price. What files are included in the topographic survey? We’ll add all your survey files to a single downloadable folder within your account and/or email you the files too. 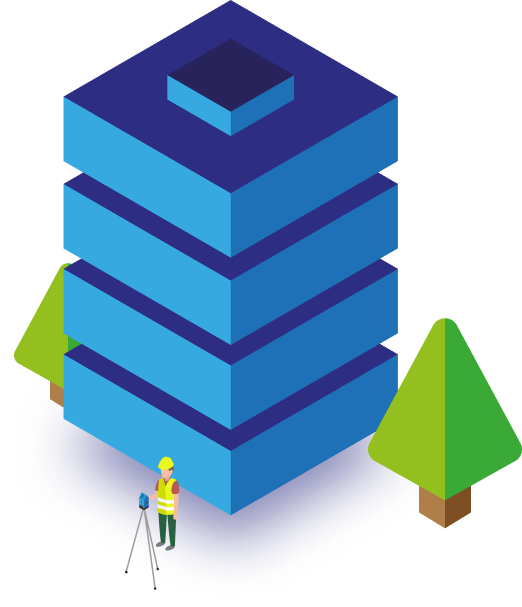 Most topographic surveys will include 2D and 3D CAD drawings, PDF layouts, photographs and any third party files used as external references in the CAD drawings. We will ultimately customise our proposal to your specification and we can provide data in a wide range of formats. Day rates start from £400 + VAT depending on specification so the total cost will depend on the length of time required to complete the survey. See our blog article "How much does a land survey cost?" for more information on this topic. Can you explain the Presentation Options? These relate to the 2D and 3D CAD files produced for the topographic survey and the PDF layouts created from them. We've created 3 templates "Low Colour", "Standard" and "High Colour" to cater to user preference. Use the "LAS" command in AutoCAD to switch the styles of your drawings. We can produce a custom template for your organisation in line with your internal CAD standards or as a white label solution. Please get in touch for more information. Base mapping provides context to your survey, but it is not compulsory. We’ll display it in the background, usually coloured in light grey. You may have access to licensed OS data if block/location plans have been prepared for your site. Or, you may have an old survey which covers the wider area and would be okay for background mapping. We can also provide LIDAR and aerial imagery for your project. What is "Survey Grid & Height"? Otherwise known as a coordinate reference system. In topographical surveying, the most common types are national and local. In most cases, your survey should relate to the Ordnance Survey National Grid. If you’re adding to or checking a historic survey, then please upload your existing survey. We'll contact you if there are any decisions to make. How do I upload more than one file? We have a one file limit, so you will need to create a .zip file. 1. Place all the relevant files in a folder together on your computer. 2. Select them with CTRL + left click or SHIFT+ left click. 3. Right click on any of the files and locate the option “Send to > Compressed (zipped) folder”. Upload the .zip file in our app. What’s the maximum file upload size? 5mb. If you’re struggling, you can continue without uploading the files. Please use another method to get the files to us. If size is the issue, we’d recommend Google Drive, Dropbox or WeTransfer. If you just don’t have the file yet, you can email it to us when you do to surveys@topographical.co.uk, using your quote reference number. Which layering system do you use? Our comprehensive layering system uses the BIM compliant Uniclass 2015 codes. Your CAD files come with pre-set layer filters to help view key information in the survey. Linework, text, levels, symbols, markers etc are individually layered, enabling a modified template to be easily created to meet clients' CAD standards. What is the camera or video symbol on my survey? The viewpoint symbol contains a link to a photo or video file. Hover your mouse over the viewpoint, hold CTRL on your keyboard and left click on your mouse to open the file. Remember to keep all the files in the folder structure we sent or the image files and other external references such as base mapping will require re-linking. Can you do volume calculations or stock pile surveys? Yes. As standard, we will report volumes on any formal and graded stock piles surveyed within your survey area. The calculation assumes the base to base method and does not apply a bulking factor. For anything more specific, please let us know when entering the survey description. Can you provide setting out services? Yes. We are trained and insured to perform setting out. Draw around your setting out area in our app, tell us about it in the survey description field then upload your design drawing / coordinate file. We’ll tailor our quote accordingly. Can you add a visibility splay to the survey? Yes. Our splays are modelled in a 3D environment. This has the added benefit of considering undulations in the road and the heights of highway boundaries. Add the parameters your site is subject to (e.g. 70 m x 2.4 m x 1.0 m) in the “Survey Description” field, and we’ll price for a separate 2D drawing of the results. Can you do watercourse surveys? Yes, to Environment Agency specification, or your own. This type of work has a lot more variables so please draw an area for your reach and upload your Watercourse Survey Specification, we’ll remove the Topographic detail features part from your quote. You may require a topographic survey of the adjacent land. If so, please add an additional area. Do you provide utility surveys? Yes, we work closely with specialist utility surveyors to deliver composite drawings including sub surface tracing using conventional and GPR (ground penetrating radar) techniques. Do you provide measured building surveys? Can you provide a glossary of common surveying terminology. Great idea, please "watch this space". Get in touch with us today and we’ll get back to you as soon as we possibly can.